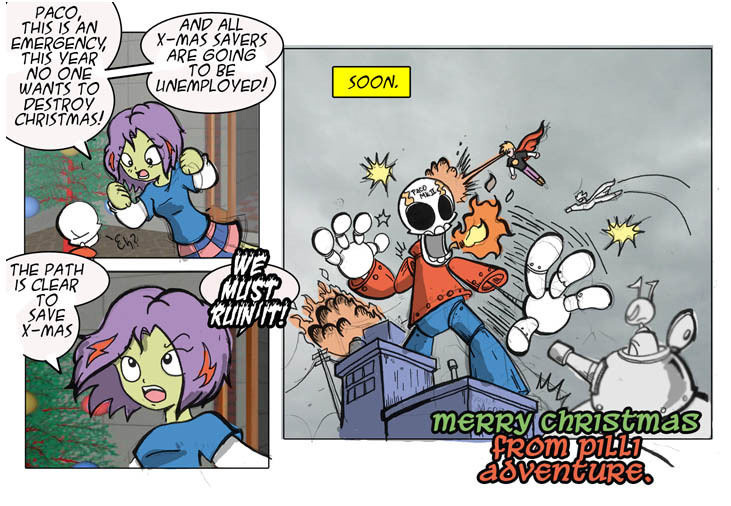 Pilli Adventure » Archive » Saving X-mas? Anyway Merry X-mas , I would like to thanks to everyone for your support your comments and readership gives me the energy and the motivation to continue and makes me happy that alll of you likes this little comic. This entry was posted on Friday, December 25th, 2009 at 3:40 am and is filed under Uncategorized. You can follow any responses to this entry through the RSS 2.0 feed. You can leave a response, or trackback from your own site. feliz navidad, pásatela chido y síguele hechando ganas a todo lo que hagas, suerte! Aw, those two are so thoughtful.